Individual tickets are $65 each or $550 for a table of 8 (tax included). 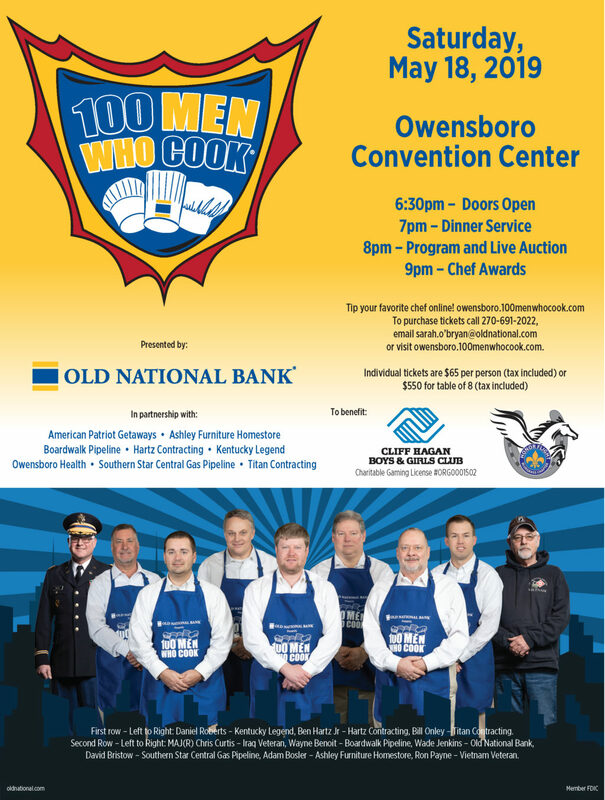 100 Men Who Cook is Old National’s signature fundraising event, relying heavily on the volunteer efforts of their employees – and the collaborative spirit of the communities they serve – for its great success. Old National holds the trademark for this event, which has raised over $6 million for charities within our footprint. In 2016, the American Bankers Association Foundation recognized Old National’s 100 Men Who Cook events with the prestigious Community Commitment Award. This unique fundraiser will feature 100 community “chefs” who will prepare their favorite appetizer, side dish, entrée or dessert just for you!